[map] [bird's eye] [street view] Out towards Garcon point, west of where Escambia Co. roads 191 & 281 meet. Very close to a monopole cell phone tower. 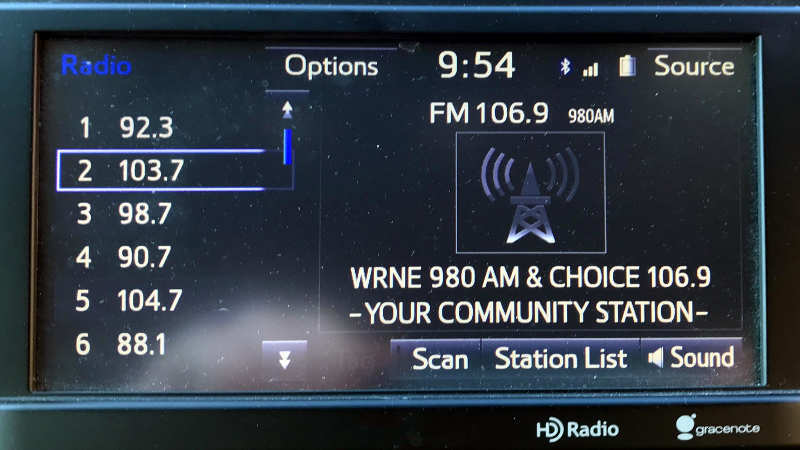 [Picture] Image showing the FM translator's RDS text display on a Toyota HD radio. Owned by Media One Communications, Inc.
980 started as WBOP around 1956. Became an R&B ("Bop") station within a few years after it started. For several decades, it was Pensacola's only station programming to the black community. Since 980 was a daytime frequency, WBOP bought the fulltime 1230 signal in the 80's and moved there. 980 then stayed more or less an Adult Contemporary station as WCHZ (Big Cheese) and WFXP (The Fox), during which time it was re-licensed from Pensacola to Gulf Breeze to get full time operation. The tower was originally near Bayou Chico, co-located with WCOA. With re-licensing to Gulf Breeze, the station constructed the current site on Garcon Point, added night service and AM stereo. One worker was killed in the construction of one of the towers. Later, WBOP (now on 1230) abandoned it's black format after 30+ years, leaving a format void. 980 returned to the black format as WRNE (Rhythm Nine Eighty), as it is today. To avoid competition with FM stations, WRNE leaned mostly towards oldies and gospel and was known as "Touch 980", carrying the Touch-braded Citadel canned music service. Sadly, the stereo was turned off some time ago. In more recent time the station's name was updated to "Choice 106.9 and 980" to reflect the addition of an FM translator that was moved in from Bay Minette in Alabama. The format as of 2015 is more modern Urban adult contemporary with some public affairs/talk programming aimed at the black community in the panhandle. WRNE and TV station WBQP-CD are co-located together at the same office complex.